In Deuteronomy chapter 6 Moses teaches the Israelites to love the Lord their God, and proceeds into an elaborate lecture on how to go about doing it and why they should do it. Some of you may not see the theme of Deuteronomy 6 as Love but as Commandment – but to me the focus is really on loving God. Love God, and God alone, because the Lord our God, the Lord is one. There is only one God – in a time where paganism and idolatry were practised by nations and peoples around them, at a time where people were uneducated and may take to worshipping everything they can – there was great emphasis on the oneness of God. Today, some people use this verse as a doctrine against the doctrine of the Holy Trinity of Christians. We will address this concept, and how, even if you aren’t tempted to turn to paganism or idol worship, this verse is still ever so important to us in modern times. Do you know what is the Apostles Creed? Can you recite it aloud? Even if you can’t, it won’t take longer than 5 seconds for you to find it on the internet. I do suggest you to memorize it. While some of the terminology used might be rather old-school and deep, it is a very important piece of declaration – or manifesto – or whatever such things are called for any Christians of any denomination or background. The Creed begins with I believe in God, the Father Almighty, creator of heaven and earth; goes on to I believe in Jesus Christ, his only son, our Lord – goes on to an elaborate summary of the deeds of Christ, and continues on with I believe in the Holy Ghost, and continues on with a few core doctrinal things. In essence, there is the Holy Trinity. They are the first 3 ‘beliefs’ that you state in the apostles creed. It is very core to this faith that you believe in all three persons of the Holy Trinity. Christianity is the only religion in the world that affirms that there is one, and only one, true God, and that there are three divine persons in the one God: God the Father, God the Son (Jesus Christ), and God the Holy Spirit. This is called the doctrine of the Trinity. The church did not come to embrace the doctrine of the Trinity because there is a sentence in the Bible that says: “there is one God existing as three persons equal in divine essence, but distinct in personhood.” There is no sentence like that in the Bible. Rather the reason the church has embraced this doctrine is because the Bible unwaveringly speaks of one true God, not three Gods, and yet reveals the Father and the Son and the Holy Spirit as God, and as distinct persons. One of the greatest passages on the idea of oneness is found in Ephesians 4, and reads – There is one body and one Spirit, just as you were called to one hope when you were called; one Lord, one faith, one baptism; one God and Father of all, who is over all and through all and in all [Ephesians 4:4-6]. If there is only one God, and if you accept that; then you should only love God and only worship God. Do not be tempted by worshipping other gods, or be taken by other beliefs, because what’s the point? In the Apostles Creed, there is no I believe in the God of the Earth or I believe in the Elephant God. Or perhaps, more applicable to some of us, there is no I believe in Money. I doubt many of us as modern Christians would be tempted to go and pray to idols whenever we see others doing so. I understand that this might not be prevalent in many countries, but in my country, where I live, if you would just walk about in the neighbourhoods and away from the city center and away from the business districts, you’ll find pretty much an altar or shrine of some sort at the most interesting places. It would be on the floor of the first wall of a coffee shop. It would be hung on the wall of a restaurant. It could be behind the cashier of a shop. In bus interchanges, you will almost certainly see one big altar by the entrance where the buses come in and out. If you go visiting houses, you notice altars of various sizes in a number of houses. Is the situation today better than it was at the time of Moses? I don’t think so. We may not be tempted to press our palms together and pray to whatever god that altar is for whenever we pass one of them. But when we meet with problems, and when prayers to God do not seem to work, would we be tempted and swayed when somebody tells us, you should pray to this god, because he is the god of healing. When you decide what to wear for the day in the morning, will you be swayed because you happened to read the astrology column yesterday and saw that you should wear red for the week? It doesn’t hurt, you know. When you furnish your new houses, would you be swayed by a friend interested in Fengshui? It doesn’t hurt, you know, to change where you intended to place your sofa just because in fengshui that’s not a good spot and blocks your wealth or luck or something like that. It doesn’t hurt. 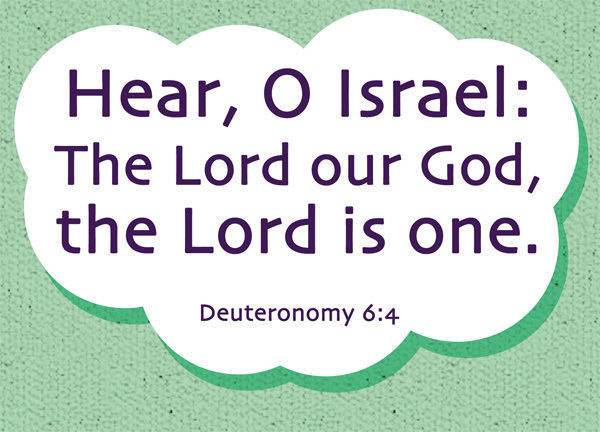 It’s just that, the Lord our God, the Lord is one. You don’t have to submit to any other gods. You don’t have to submit to any other faiths. In fact, you shouldn’t [Exodus 20:3], lest you incur the wrath of the one, true, God [Exodus 20:5]. You probably don’t even know what Feng Shui is? It’s rather common in some Chinese countries, and even a lot of government architecture in my country seem to hold great emphasis on fengshui. It’s a very Chinese thing, and I honestly don’t know how to explain it – it’s like geomancy, and used traditionally in architecture. Very much like superstition and myths, I guess. I know little about other cultures, being raised myself in a rather colorful and interesting society, but surely every culture and every nation have their own quirks and customs. Sometimes it becomes so natural to us that we don’t think of it as an idol, or as another faith. Let us be alert, and let us be on guard, and let us remember, no matter what that the Lord our God, the Lord is one.